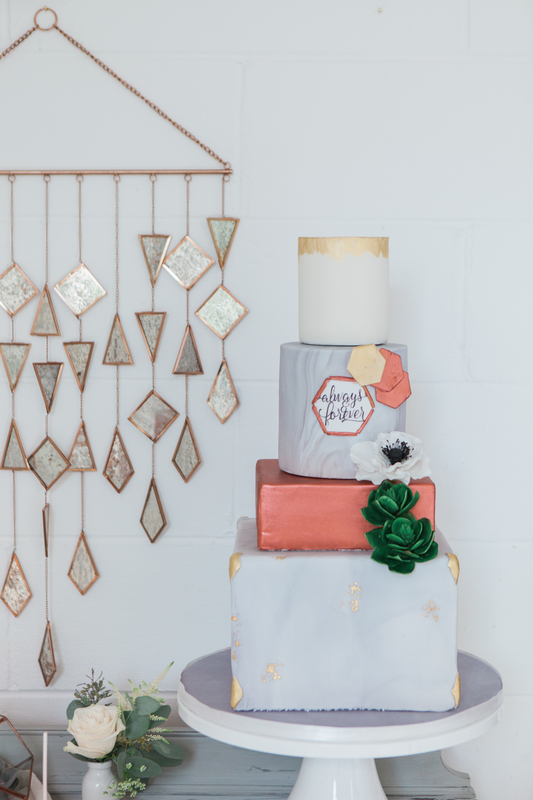 With Copper accents being a super popular wedding trend, we wanted to give you the lowdown on how to work this metallic into your own wedding decor! 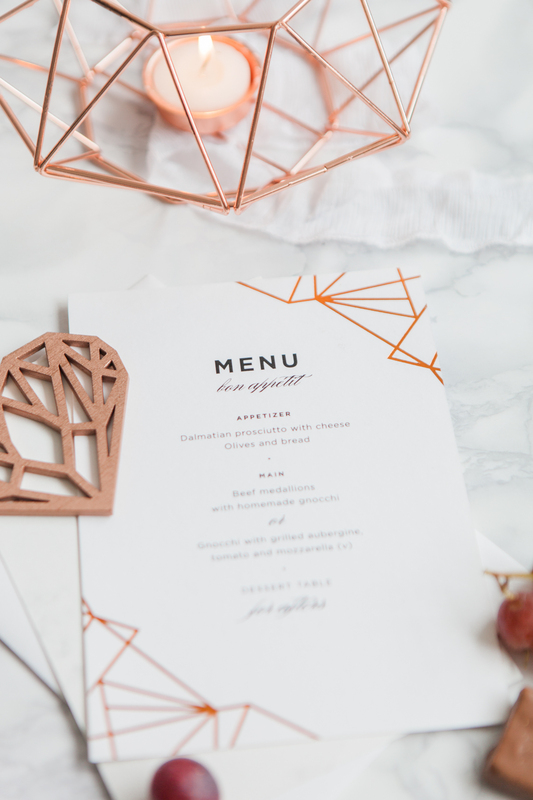 If you missed the Lovely Copper feature last week it’s a must see styled by Laura of Your Wedding Your Way and captured by Amanda Karen Photography. 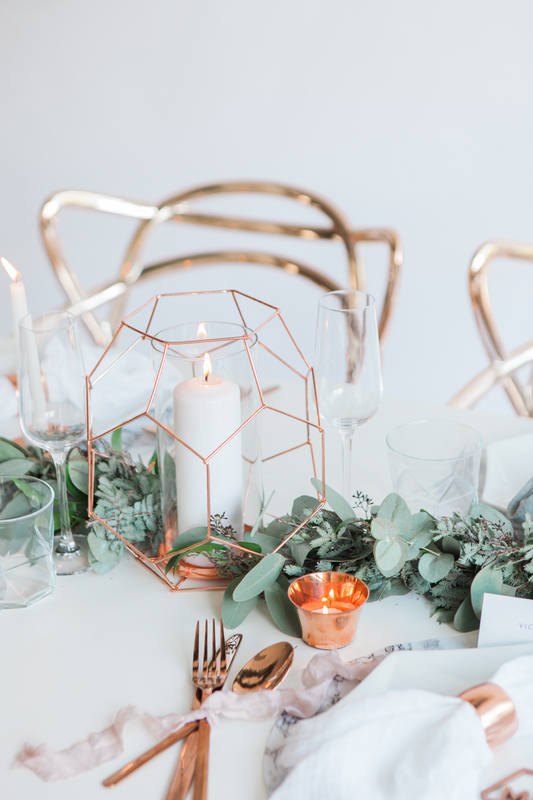 Laura is here to provide her expert tips on using copper tones including working with both the more industrial style wedding or the softer more traditional style. 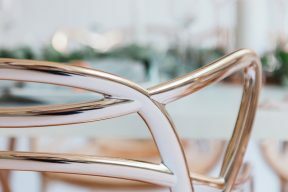 “Metallics certainly are one of the hottest styling trends at the moment. 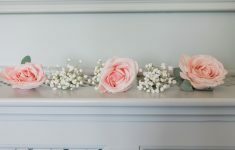 They are a fabulous way to lift any wedding design and give it an extra element. 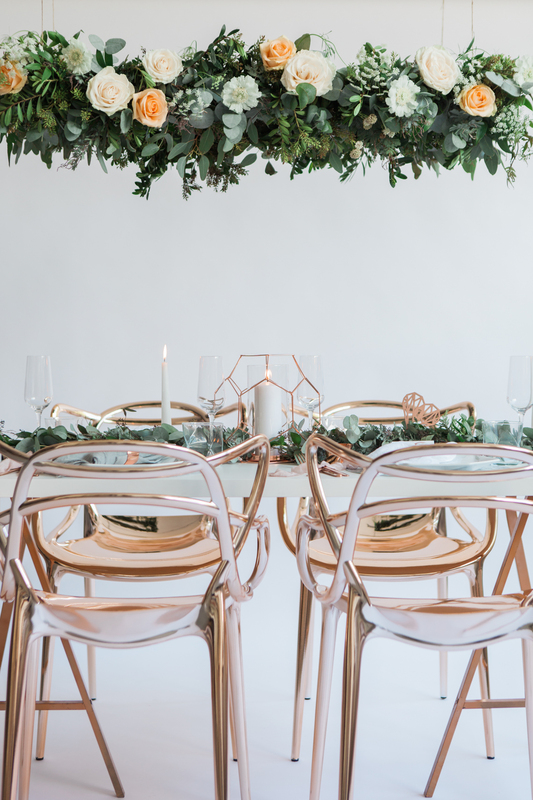 While traditional gold and silver are not going anywhere, rose gold and copper have also been on the increase and more and more couples are embracing their use not only in their homes but now in their wedding design as well. 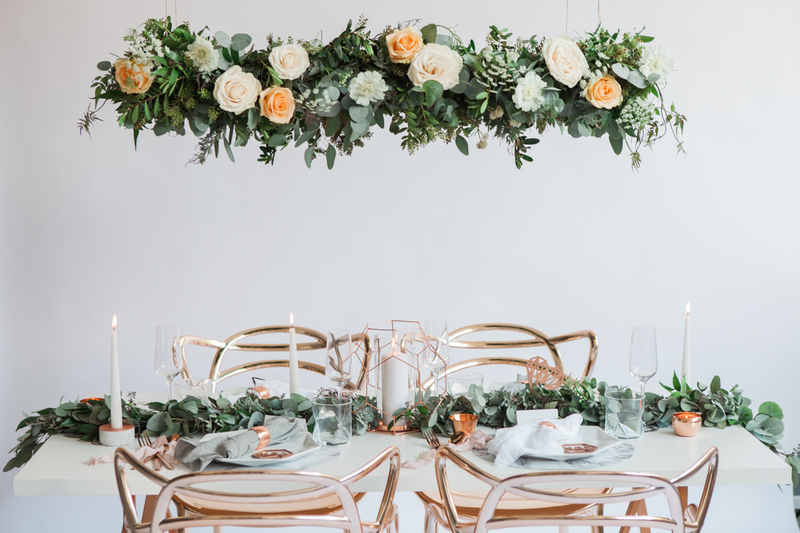 Copper can often be associated with industrial style, urban weddings but when teamed with soft florals and elegant settings it can also be super pretty and so versatile. Simple details from copper flecks on your place cards to incorporating copper detailing into your cake and signs are just some of the ways you can bring copper into your day in a subtle way. 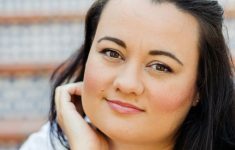 To really embrace it, there are plenty of elements of the day you could incorporate. 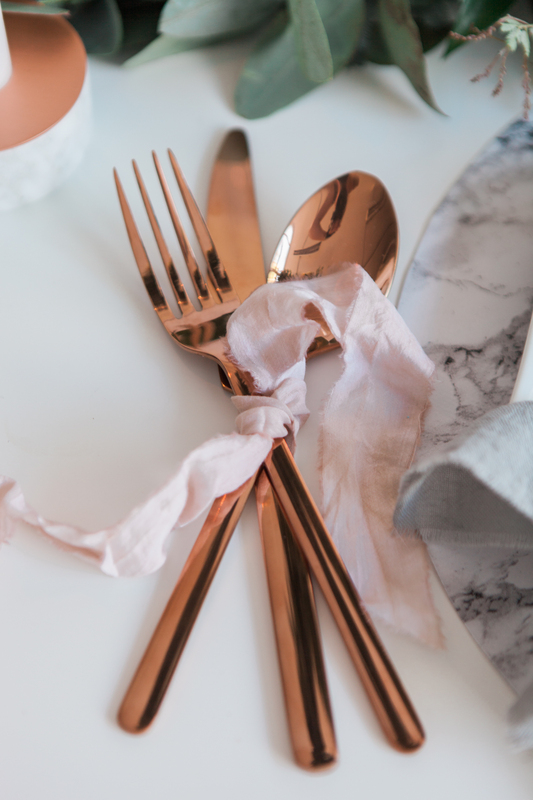 Just changing up your cutlery from the standard silver options will really make your tablescape look so much more considered and stylish. 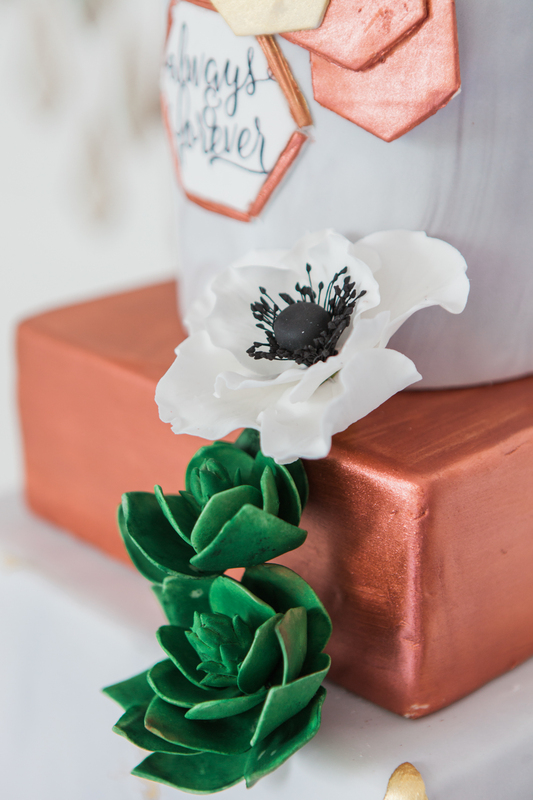 Wrap them in a matching ribbon and you have instantly made the whole look more cohesive and added a softer touch. 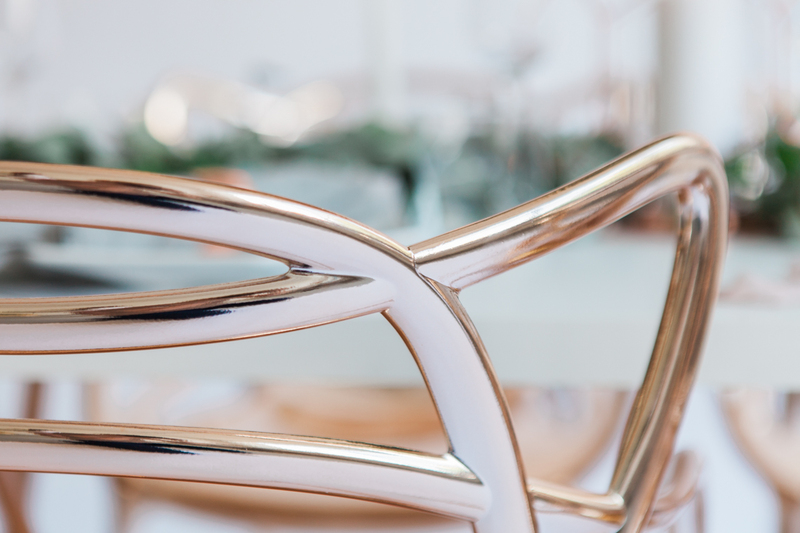 If you want to really make an impact, consider changing up your chairs. They take up such a significant percentage of your space and will have one of the biggest visual effects when entering the room. They can really make or break a styling concept but are often overlooked and an upgrade is sometimes considered a luxury when in reality, the cost isn’t always significantly more. 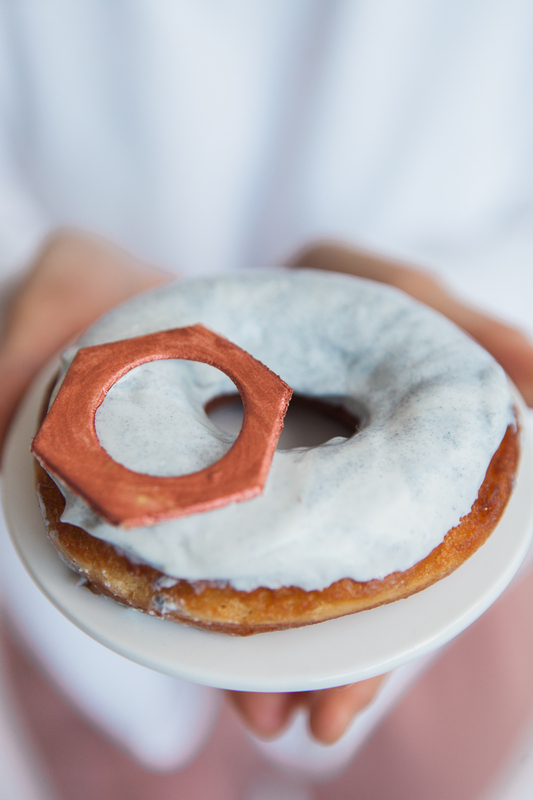 Copper paint is also easy to come by so why not get creative and spray paint some tired old frames and use them for your table numbers or signs around the venue? 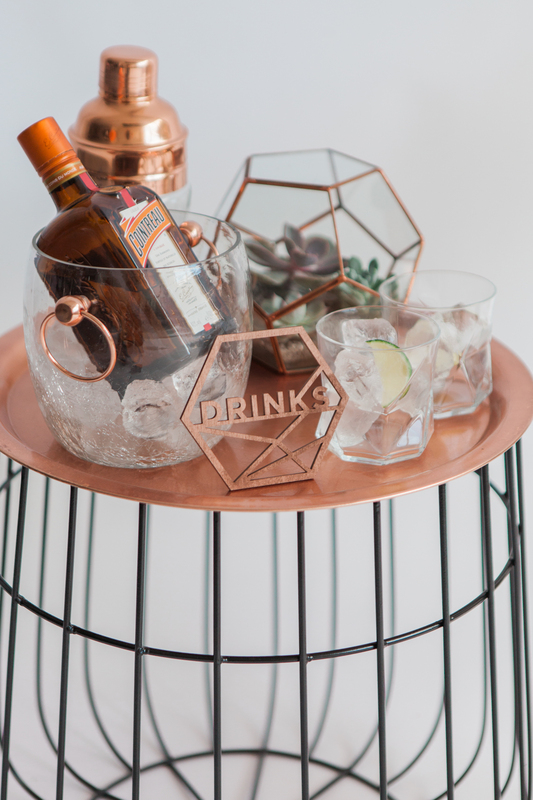 You could transform a piece of unused furniture into an awesome drinks trolley or table for your cake or cards and keep it perfectly in tune with your day with just a lick of paint. 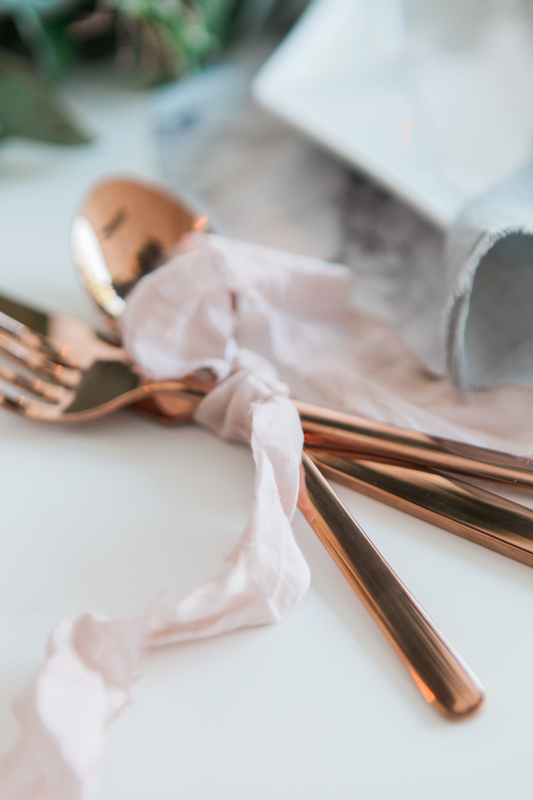 Copper works well with so many different colours but especially warmer tones such as peaches and pinks or to contrast, teals and deep blues. 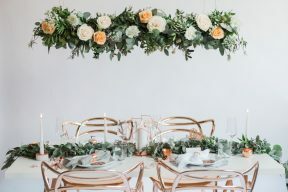 It also looks super stylish left with white, making copper the only accent along with the greenery in the foliage and florals; a classic, elegant and timeless combination. 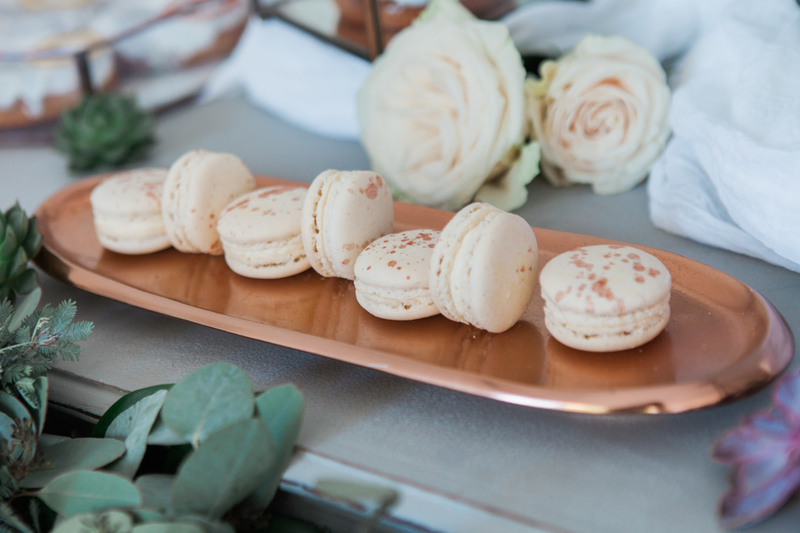 You can also mix copper with different textures such as marble to add interest and incorporate this into your place settings with place mats or use marble dishes in your dessert table. 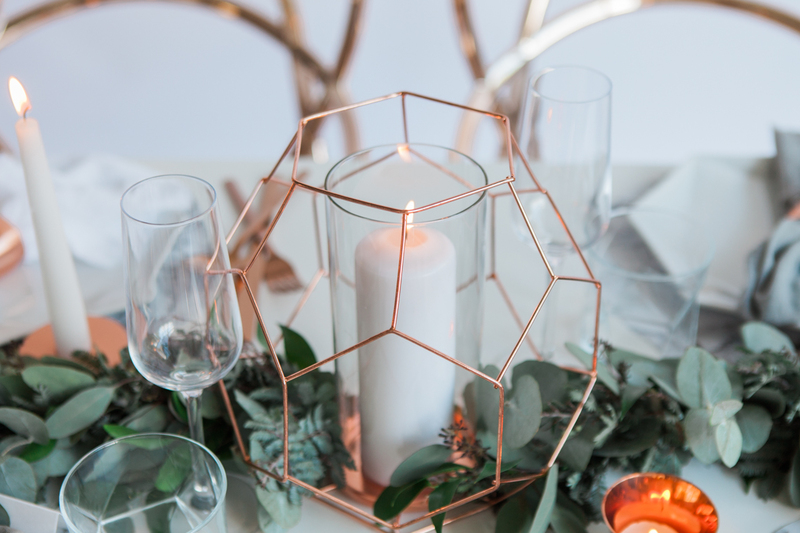 A marble base to the centrepiece could bring a gorgeous unique touch to your occasion while using copper vessels for the candles and flowers will ensure the copper element remains strong and impactful. When considering the outdoor areas, why not use copper lanterns or planters? 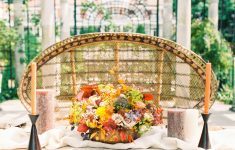 They can be dotted around the lawns and gardens to make sure the entire venue is considered in your design scheme and a cohesive look is achieved.